We all need a little tender loving care from time to time, especially after a busy day on your feet. Designed by a podiatrist, Chirocream is a high quality range of footcare creams enriched with natural ingredients to keep feet in fantastic condition. Each cream has a specific purpose and a soft, rich texture for applying to the skin. They come in 500ml bottles, as well as 100ml tubes to sell to patients. 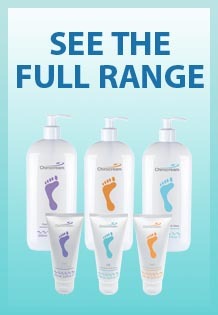 Chirocream Foot Care Cream is a quick acting, highly effective moisturising foot cream. It cools, soothes and refreshes tired, strained feet. Perfect to use at any time of the day, it provides a refreshing morning wake up call, ensuring your skin is ready for the day ahead, or it can be used after a long day to soothe tired, aching feet. Chirocream Foot Warming Cream is a soothing, warming cream that stimulates circulation and revitalises dry, sore skin. FWC prevents foot odour, is anti bacterial and anti-inflamitory. FWC eases joint and muscle pain and can be used to soothe conditions including arthiritis and rheumatism. Chirocream Heel Balm is a super hydrating balm, specifically formulated with urea to sooth and repair severely dry skin and reduce the appearence of cracked heels. The fast acting formula immediately starts hydrating and repairing the skin with visible results after just one aplication. HB is suitable for sensitive skin and can be used to treat skin conditions including eczema and psoriasis. Please note: 500ml refill bottles are sold with an end cap. Dispensing pumps can be purchased separately. Enriched with natural ingredients, all Chirocream products are lanolin-free and are not tested on animals. We supply chiropodists and podiatrists across Europe with the full range of chirocream products via our European partner based in Belgium.